Otosan® Ear Cone fights ear wax. With its purifying properties it helps to solve hearing conditions such as buzzing, whistling, background noises, transmission loss and blocked-ear sensation. Otosan Ear Cone arose from the rediscovery of a traditional ear hygiene method, called auricular thermotherapy, a gentle technique with ancient origins. Enhanced with innovative safety and comfort devices, the Otosan Ear Cone is a natural, practical, safe and effective device, which, through beneficial heat and a chimney effect, helps to eliminate impurities and excess earwax from the ear. Otosan Ear Cone therefore helps to prevent the build up of wax plugs and supports their removal, contributing in this way to restoring ear pressure, for example, after spending time in the mountains, flying or scuba diving. Its purifying effect helps to solve hearing conditions such as buzzing, whistling, background noises, transmission loss and blocked-ear sensation. It is recommended for adults and children, and especially for people working in dusty environments, for those suffering from excess earwax and people who use external hearing aids. 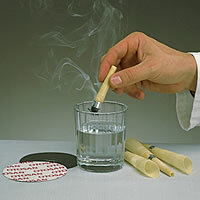 It also helps to eliminate any residual water in the ear canal after swimming in the sea or a pool. Today, with the addition of propolis, Otosan Ear Cone develops an efficient protective action for the ears since the heat created regenerates local blood flow, providing a feeling of well-being and general physical relaxation. Otosan Ear Cone is available in 2 or 6-cone boxes. 1. Insert the narrower part of the ear cone one centimetre into the Comfy applicator. Make sure that the other Comfy applicator is not inside the ear cone. 4. When the flame has burnt down the ear cone to the Flame-breaking ring, take it out of the ear and extinguish it in a glass of water. Repeat this treatment in the other ear. Consumer protection is one of our most important values. This is why our ear cones are equipped with four protective devices so that they can be used safely. The Flame-breaking Ring automatically extinguishes the flame and shows the correct lighting area so that treatment may be interrupted, making it easier, safer and more practical to use. The Protective Disc, applied to the base of the Otosan ear cone, protects the ear and the head during the entire treatment. 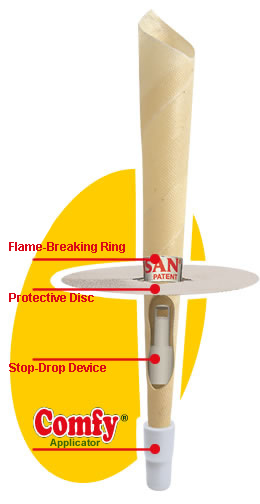 The Stop-Drop Device, inserted inside the Otosan ear cone, acts as a drop-stop valve that prevents any melted wax or other combustion residues from entering the ear canal. The Comfy Applicator is the new exclusive patented device, which makes this treatment extremely comfortable and also guarantees maximum treatment effectiveness and safety. Among the latest achievements of our ongoing commitment is the new Comfy invention, which, as the name suggests, is one of the main improvements to the ear cone. The soft, patented device fits to the walls of the ear, making the treatment more gentle and pleasant. In addition, the applicator increases ear cone safety, since it ensures correct positioning at the right depth in the ear canal. 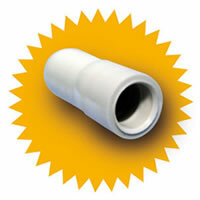 Finally, the device reduces the entrance hole, thus concentrating the effect and increasing treatment effectiveness. Our company is always attentive to people’s needs and their psychophysical well-being, thus it has become a benchmark in the sector for the high level of its quality standards. In order to increase the effectiveness of our products, thanks to extensive laboratory research, we have enriched our ear cone with propolis, a natural substance produced by bees that is renowned for its healing properties. Modern medical science has demonstrated that propolis has a general probiotic action that also provides effective protection for the ear. Once the ear cone is lit, the propolis in the Otosan ear cone releases its volatile fraction that penetrates gently into the ear canal, improving its natural defences. The pursuit of excellence has always been the driving force of our activities. This is why every day we passionately commit to studying the quality and safety of our products. We are also equipped with modern plants that guarantee top-quality products; our ear cones for ear care are subject to scrupulous checks and comply with current regulations. As we believe that a culture of well-being should be in total harmony with the environment, we also make products that are not tested on animals, and use recyclable paper and cardboard boxes. With this same goal in mind, we engage in ongoing research to improve our knowledge and expertise of the natural remedies of the past in order to rediscover, perfect and promote them. 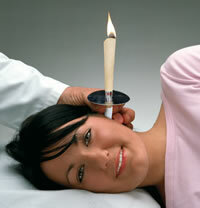 The "ear candle" has an ancient history and its rediscovery is closely linked to ethnomedicine, a discipline that helps us to restore the effectiveness of many natural methods, as well as the awareness of an inevitable harmonious relationship between humans and medicine and the belief that a general psychophysical balance is necessary. In fact, ethnomedicine is based on a holistic view of individuals, which embraces the mind, body and social being, and analyses health, well-being and healing from the point of view of other cultures that cherish age-old knowledge. For this reason, ethnomedicine studies communities where an ancient popular tradition of care is still intact and which regularly resort to collective rituals and natural remedies. Among these is the ear cone, also called ear candle, which has existed for thousands of years in many parts of the world. It was used among many ancient civilisations, such as the Aztecs, the Greeks, the Romans, the ancient Egyptians and other populations, not only for ear hygiene but also for spiritual purification. In addition to waxed fabrics, linen, cotton or hemp, the ear cone was also made with rolled tobacco or corn leaves. 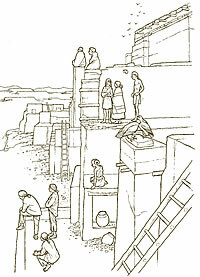 In Egypt, the reeds of the Nile were used with pressed mud to create protection around the ear. 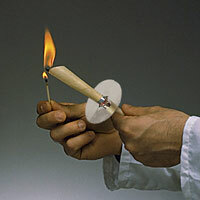 The candle was also widely used in Italy, especially in the rural regions of Romagna, Veneto and Sicily. At Otosan, we have rediscovered and enhanced this ancient technique in order to offer an effective treatment for ear health and general well-being. By acting indirectly also on the points used in acupuncture, the ear cone contributes to creating a sensation of total relaxation, as can be perceived after treatment. 1. How often should it be used? 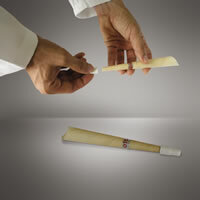 We suggest using the Otosan Ear Cone about once a month, depending on individual needs. 2. Which conditions is it recommended for? The Otosan Ear Cone helps to remove wax plugs and solves some related conditions, such as buzzing, whistling, background noises, blocked-ear sensation, ear pressure imbalance and transmission loss. These conditions may, however, be linked to other pathologies; therefore, before using the ear cone please consult an ENT specialist to verify the presence of a wax plug and rule out other causes. 3. Does it have any side effects? Scientific research has demonstrated that the Otosan Ear Cone is normally well tolerated. Before use, please read the instructions. 4. Can I use the Otosan Ear Cone together with the Otosan Ear Drops and Otosan Spray? The effectiveness of the ear cone is improved when combined with the ear drops and/or ear spray. In fact, these combined solutions are a complete system that ensures truly accurate hygiene and natural well-being for the ear. 5. Where can I purchase the Otosan Ear Cone? Otosan products are available in this online shop as well as in pharmacies in Germany and Austria.